Bettin.gs blog – Page 3 – The easiest way to track your bets and manage your betting portfolio. The easiest way to track your bets and manage your betting portfolio. To help showcase how the Secret Betting Club can help your betting, they have put together an updated FREE SBC Magazine for you to download today. It features their recent reviews of 2 profitable tipsters (1 football and 1 racing) plus an interview with one of the most popular and admired racing experts in the business. After a lengthy spell of proofing, read SBC’s concise analysis on this profitable racing tipster up 464 points profit in 3 years from 3919 bets. Best of all, these tips have been settled at prices available on Betfair so offer a potential solution for those of you unable to bet with bookmakers. Earlier this year, SBC unveiled their review of this over 2.5 goals football tipster, who has impressed greatly with their profitability and ease of following since proofing began in 2012. Over the past 7 months alone, they have notched up 47 points profit at 14% ROI from 225 bets and have a long-term record of substance. Wayne from the Northern Monkey Punter tipping service is one of the most popular and foremost experts when it comes to advising bets on horse racing, generating fair profits year-in, year-out for his loyal followers. To understand just how he makes money from his betting, you can read SBC’s interview with him from earlier this year on the secrets behind his punting success! More Free Reviews, Reports & Racing Tips! If you want to read more free SBC reviews and expert features, you can do so by registering for a Free Secret Betting Club Membership today. Free Bonus SBC Magazine – Download a 2nd FREE SBC Magazine featuring 2 more profitable tipster reviews and advice from semi-pro punters making their betting pay. Free Tipster Profit Report – Download a free copy of this popular report and learn how they track more than 60 profitable tipsters on SBC member’s behalf. Free USA Tipster Report – Pick up a free copy of their special US based sports reports featuring 2 tipster reviews and a how to guide to betting on NBA. While the most common way to enter and display odds, at least on Bettin.gs, is in the decimal format (like 3.5), many people prefer the fractional way (like 5/2). Good news is, from today you can choose your preferred way yourself. If you want to switch to show odds in fractional format, head to your Settings page and look for this setting. Once you’ve pressed save, all odds on the site will be shown in the selected format. By the way, you can enter the odds in any format you like, but how they will be displayed is decided by this setting. Many of you are placing your bets on betting exchanges such as Betfair and Betdaq and, as you know, they are charging commission for your winning bets. This commission is now possible to take into account at Bettin.gs. From today, you have the option to enter the commission you pay at the different exchanges on the settings page, in percent. The commission you enter will automatically be deducted from from the bets you win using that particular bookie and will therefore affect both your result and stats to show more realistic numbers. If the commission you pay changes for a bookie, just change it on the settings page and all future bets you place at that bookie will use the new percentage in the calculations. Older bets already settled will not be affected. Regular bookies normally don’t charge commission, and in that case commission is set to 0, which is also the default value. This feature is available for all Bettin.gs Pro use as we speak. Enjoy! If you’ve connected your Twitter account to your profile, chances are you’ve also selected to share your bets automatically. It’s by far the easiet way of letting your friends and followers know about your bet. You find the settings for this at your Settings page. It’s available for all Bettin.gs Pro users as we speak. As you’re using Bettin.gs you’ll probably notice the value of tags. We’ve written about the advantages of using it before, and now it’s just gotten even better. Let’s for example assume that you’re using one tag for all bets you place in a country, say Russia, and another one for all football bets you place in Premier League. The #russia tag would represent all bets in all sports in Russia and #premierleague would represent all bets placed in the Premier League – that could mean English Premier League as well as the Russian. Now you can select to filter out all placed in Russian events which would include all sports (unless you’ve used the Sport filter) having that precise tag. 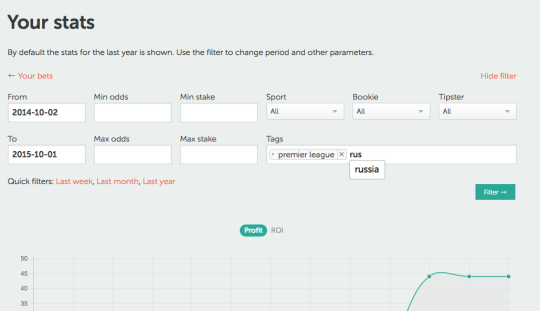 Adding the #premierleague tag would filter out all bets in the Russian Premier League and should you use only the #premierleague tag, naturally all bets from both Russian and English Premier League would be shown. Combining this and the other available filters provides the perfect mechanism to find the exact stats you’re looking for. Another example: Using tags, you can select to filter out all tennis bets ever placed, or you can filter down on all tennis bets you’ve placed on #WTA tour, the #ATP tour or for all #doubles. Should you want to know how a certain tipster performs on #singles vs #doubles, just apply the approprate filter and select the tipster from The Tipster drop-down. To know how your bets went in the latest Tennis mens tournament in China, filter on #ATP, #china and #singles together with the Sport and Date filter. I’m sure you get the point, and you probably have your very own way of organising your bets into categories. With this latest update it will be even more powerful to apply to your stats! We are sure you all will find your own way of using this. As always, shoud there be any questions, just hit us with them. Our first update of the stats page for a while is here, and it looks like this, placed just under the graphs. The stats are better and the numbers are more. The box consists of tabs where you can see stats per for different odds intervals, per bookie, per sport and per tipster on top of the general and the misc stats that was already available before. 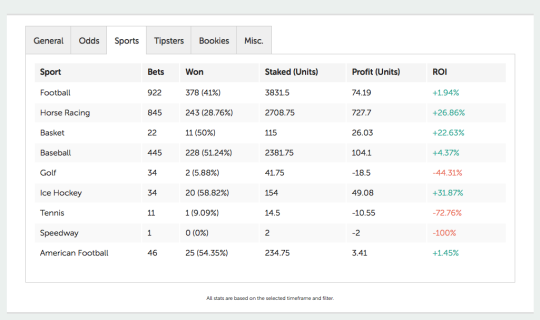 The structure is the same for each tab and the stats you can see for each row is the profit, the number of bets and hit rate, how much is staked, the profit and the return on investment (ROI). So, check out your stats page for the new numbers. Naturally, it works just as great on your desktop computer as on your mobile phone. Today we’re happy to release one of the most requested features of late – the possibility to follow a user. Many of you have found a certain user at Bettin.gs that you want to follow, to keep up with their betting advice, to discuss certain games or just to find the most suitable and profitable one for your betting needs. With this new solution that becomes a lot easier. Each user now has a “Follow” button at their profile and every user who chooses to follow receives an email for every bet that is registered by that particular user. It’s not harder than that. This feature is available right now for all Bettin.gs pro users. Hope you like it!